I didn't choose the drunk life. The drunk life chose me! Ooh, Don't You Know It! Piss Beer, I Choose You! Alakazam: "Bro, this isn't the Enterprise, this is Taco Bell..." Abra: "You're welcome." Bro Used Doubleslap! It's Super Effective! What about Koffing and Weezing? 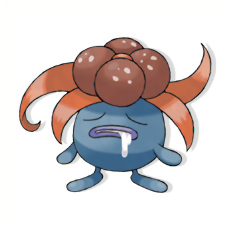 Gloom, perhaps (c'mon, just look at her and tell me she's not blitzed out of her skull). It's electrifying! Via The Drunken Moogle. Directions: For the Pichu: pour the the creme de banana, then layer the pomegranate schnapps, then layer the Jager on top. Pikachu: pour the grenadine, next layer the creme de banana, then layer the captain tattoo on top. Raichu: pour the creme de banana, layer the Jager then layer the captain 100 proof on top. It's The Weekend! Party Til You're Pooped! The weekend's almost here, so let it all out! Just try not to get it all over the walls. Click through the gallery and party!